Hello Hello!! Happy Thursday!! I found a thrifted chair for $10 awhile ago. 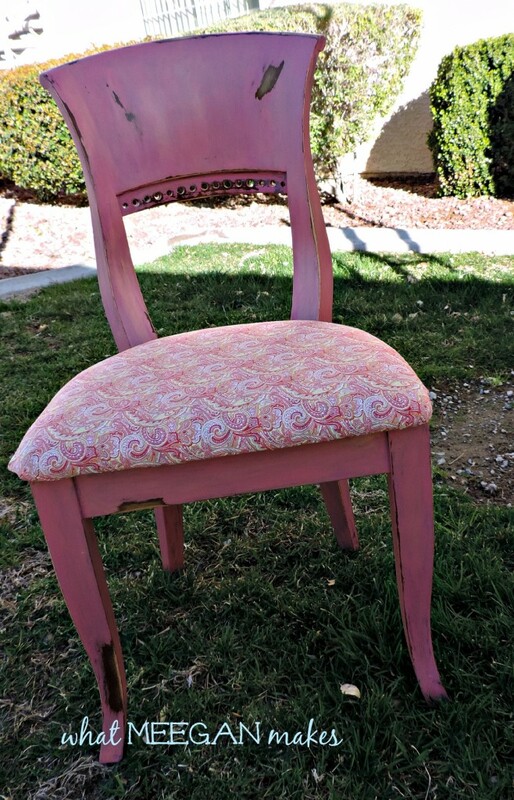 Today I am happily sharing my Thirfted Chair Makeover Using Chalk Paint and Gold Wax. As soon as I spotted this lovely chair, I knew I needed it. I have been wanting a new computer chair that is more my style. The one I have now is a pretty common country style chair. Not me. But, I was fine with it. THEN, I saw this and put it in my cart. For this makeover I used Country Chic Chalk Paint. I feel in love with the color: Cherry Blossom and thought it would look fab on my new chair. I was right so far, huh?? It already looks like a completely different chair. While the paint was still almost dry, I used a 60 grit sand paper rubbing some “worn” spots into the wood. 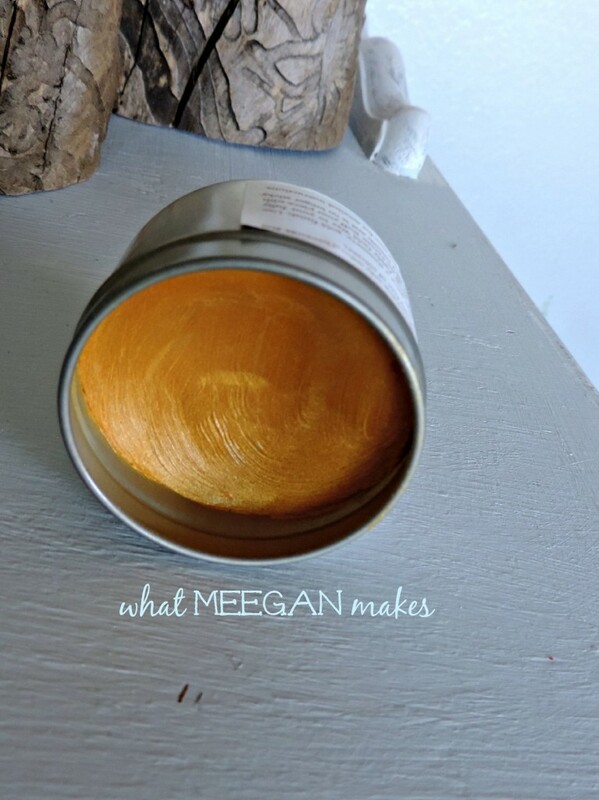 Once the paint was dry, I rubbed in gold wax, also from Country Chic. I was excited to see specks of gold with the cherry blossom color for a metallic finish. This is showing you how much I rubbed in. I really wanted a subtle metallic look for this chair. This isn’t the best coloring and it was taken directly in the sun. I did this so you can see the sparkly, metallic look I was hoping for. Oh, wow! Love the look. After the wax had been rubbed in and left to absorb into the paint, I made a new seat cover. Love me some paisley, don’t you? 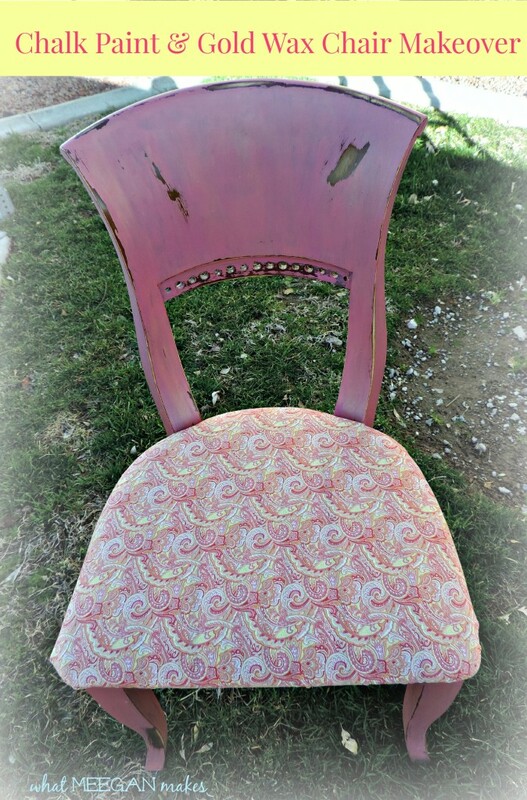 I am super pleased with my Thrifted Chair Makeover Using Chalk Paint and Gold Wax. The touch of slight metallic finish melts my heart. She looks so happy in our home, now. As a matter of fact, I am sitting on my “new” chair as I write this post. I KNOW you would love to see other metallic finishes and makeovers today, as well. SO, six other bloggers are sharing their metallic makeovers, too. You will be inspired by each one. They are listed in the linky below. Make it a thrilling Thursday. 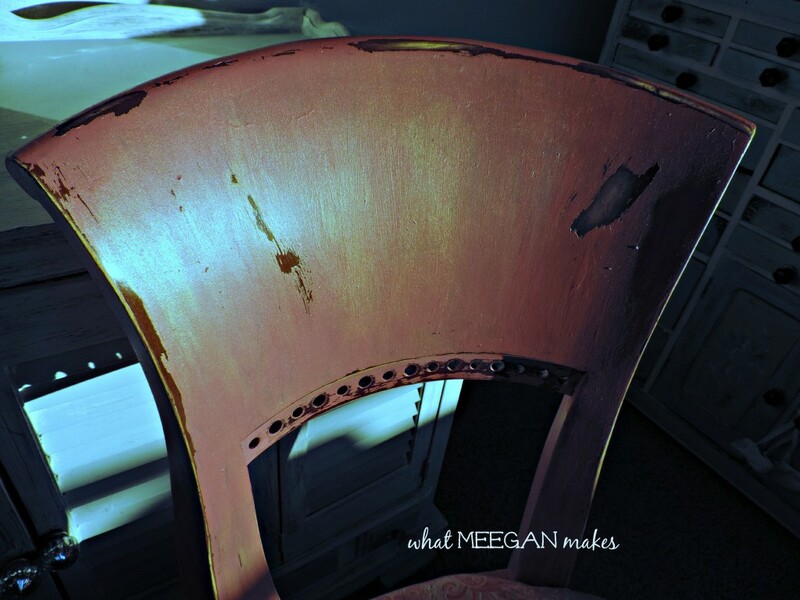 Meegan you are super talented, your blog is super cool and this chair is super cute! That’s sweet Christy. Thanks! Make it a great day! I have never heard of gold wax, but I am so excited about it. This is a must have for me as I have been working a french country theme into my living room. Pieces I have painted in a creamy yellow I also accented with a gold and then dark waxed all of it. I think the gold wax would work brilliant for my theme. Thank you for the heads up on it. Oh wow, Debbie. The gold wax would BE perfect for your taste and design. Good luck. I can’t wait to see what you come up with. Meegan, another awesome furniture makeover! So pretty in pink and metallic gold and the upholstery is perfect! It caught my eye at the Live Laugh Party. Thanks sweet Marie. I am glad my makeover caught your eye and you stopped by. I had no idea that gold wax existed. I need to find some for a future project. You chair turned out beautifully. I love the fabric you chose and the combination of pink and gold. Isn’t it so fun Paula! I am so happy you came by today. I love having you here. Love it! Can you order that paint online? I don’t have any retailers close to me. thanks much! Thanks Carolann. Yes, you can, Click on the link listed in the post and it will take you directly to their site. Good luck and have fun! Meegan! 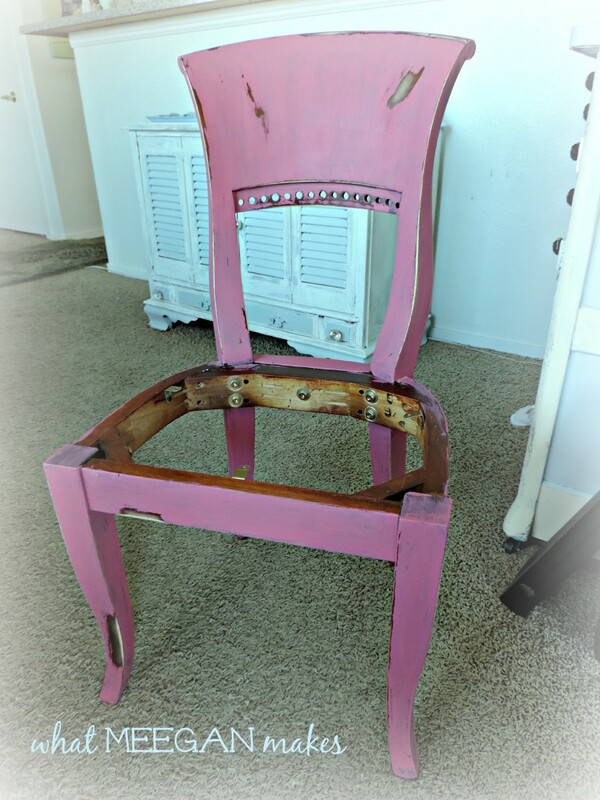 You did a fantastic job on your thrift chair. It’s beautiful! I love the pink and soft metallic gold finish. LOVE! Why, thank you Suzanne! I take that as a very high compliment. I would love to see your projects. Wow i would have never been so brave as to use pink but it looks amazing! Wondering what I can paint pink now…. Thanks so much, Jen! It was a fun piece to work with. And a pleasure to hang out with you today!! Love the chair Meegan. I will have to check out this paint. The Cherry color is beautiful and the gold wax is the perfect accent!!! 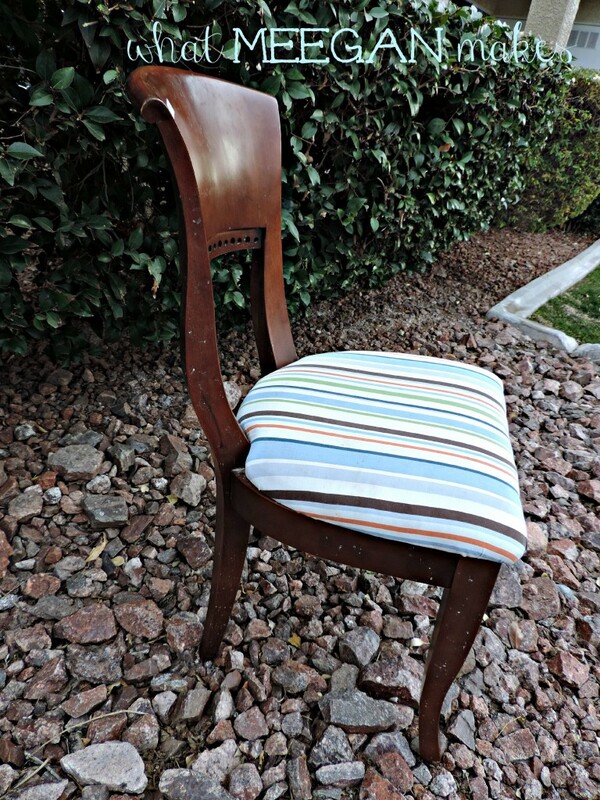 Awesome chair transformation Meegan! The gorgeous gold wax you used was like the cherry ;) on top! And yes! I LOVE me some paisley too. 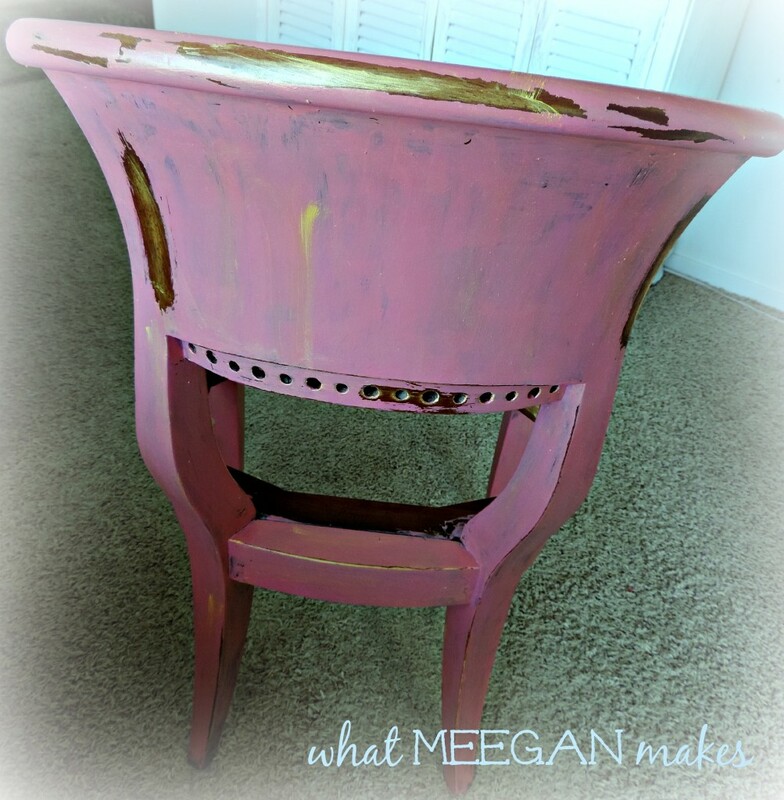 Fantastic project Meegan… I love the pink & gold and the fabric you chose is fun,fun,fun! That chair turned out just beautiful, the hints of gold add just the right amount of sparkle too – lovely! Thanks so much Heather! I love your compliments. 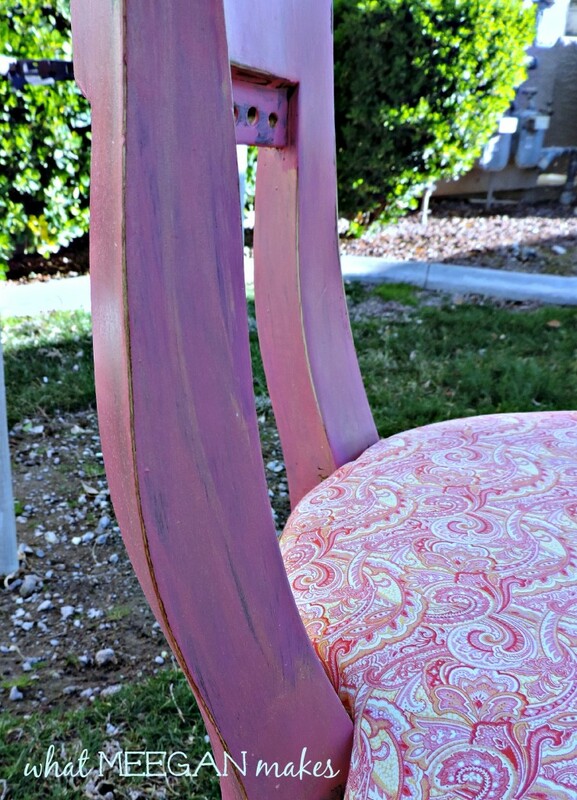 Gorgeous chair – love that paisley fabric! YOu had me at gold!! lol!! Wow – such an amazing makeover! 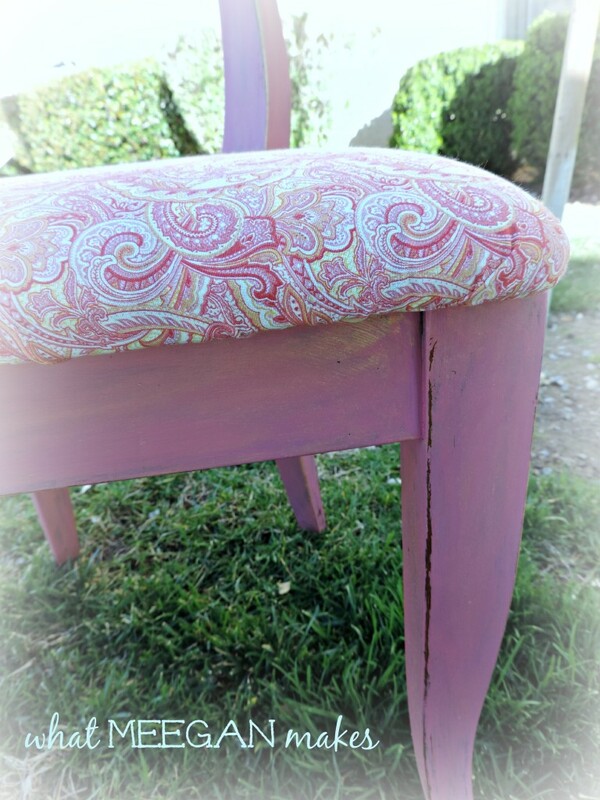 I love the pink paint, fabric and of course that glam gold wax! Must.get.!!! I know! Isn’t it so cool, Heather??? Thanks Kammy :) Love your party!